The new restaurants in Newcastle just keep on coming. Greys Quarter is a particular area of investment – the £25m development that’s opening this month includes 20 new restaurants. One of those restaurants is George’s Great British Kitchen. With a playful seaside theme this is the sister restaurant of the successful George’s in Nottingham and based on a background in the chip shop business. Me and GG haven’t caught up for a while (the last time was when we went to Bierrex) so met up at George’s for some food and gossip. 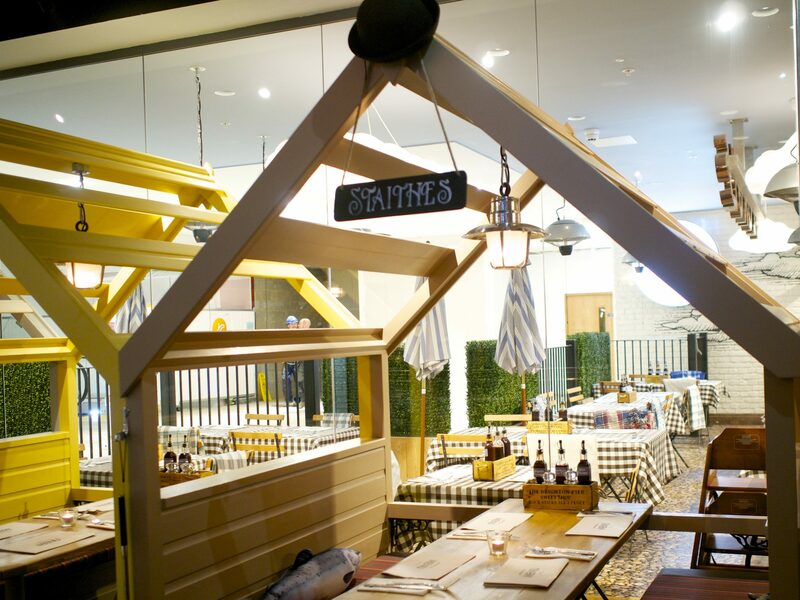 The restaurant is on the right side of tasteful with beach huts and bowler hats transporting you to the Victorian seaside. Selfie sticks and fish cushions are also scattered around in the hope that you’ll have a laugh (and stick them on social media). 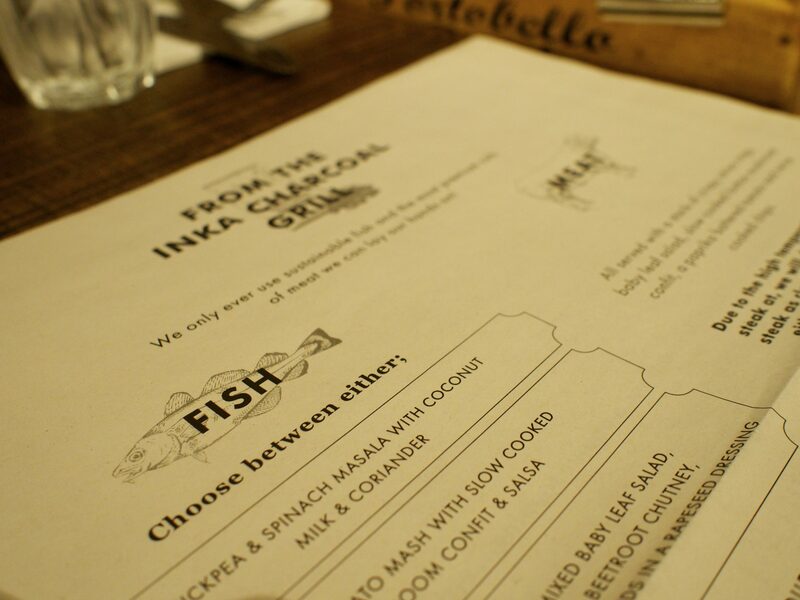 Perusing the newspaper style menus we decided to forgo starters and headed straight for the mains. With a focus on ‘Great British classics with a twist’ there was plenty to choose from. Feeling indulgent I went for the Proper Dirty Double Burger – Two burger patties made to their recipe using the finest chuck and brisket, grilled in the Inka Charcoal Grill and topped with red Leicester (£12.95). 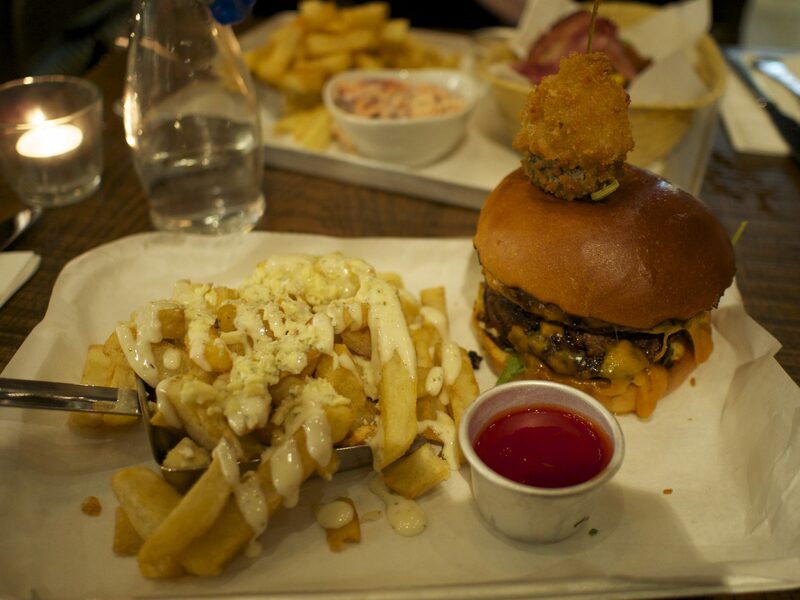 Burgers are served with a choice of add-ons which include ‘very cheesy cheese croquettes’ and sweet potato fries but I decided to go all out and went for Stilton fries – go hard or go home! 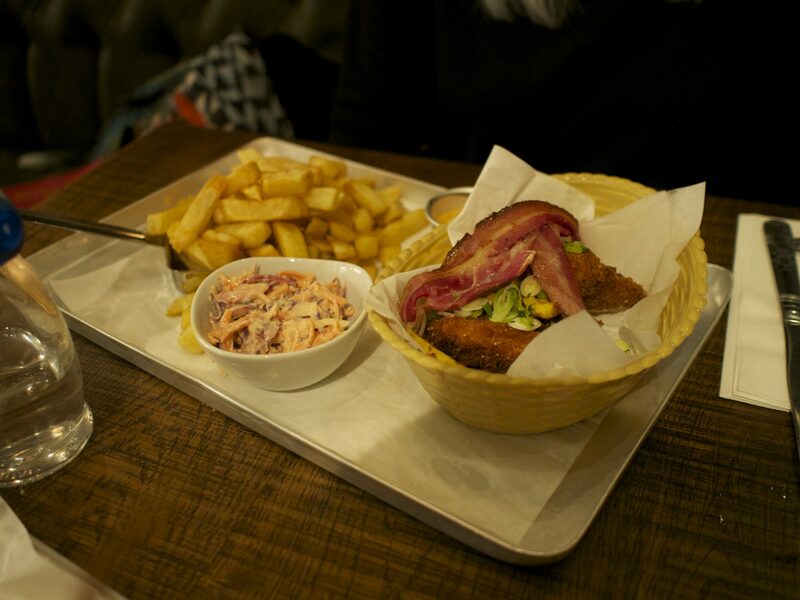 GG was in a quandary as to whether to go for the Saveloy pie or Chicken in a basket – Butterflied chicken breast in a light lemon pepper breadcrumb coating, served with maple grilled smoked bacon, sweetcorn pancakes, campfire slaw, twice cooked chips and a spicy chipotle mayo dip (£12.95). The chicken won out in the end. Both of our dishes sounded more American than British if you ask me but hey ho! We fooled around with a couple of the props while we were waiting for our food, despite its gimmicky nature we had a laugh and it was a good distraction from our rumbling tummies. The food arrived promptly. Service on the whole was good if a little slow at times, and we were told that quite a few things had run out including Diet Coke! Any new restaurant is going to have teething problems so I’m sure they’ll sort this out. My burger came served in a brioche bun with baby leaf salad, a slice of tomato, thin slices of pickled gherkin, lashings of dirty mayonnaise and tomato ketchup on the side. 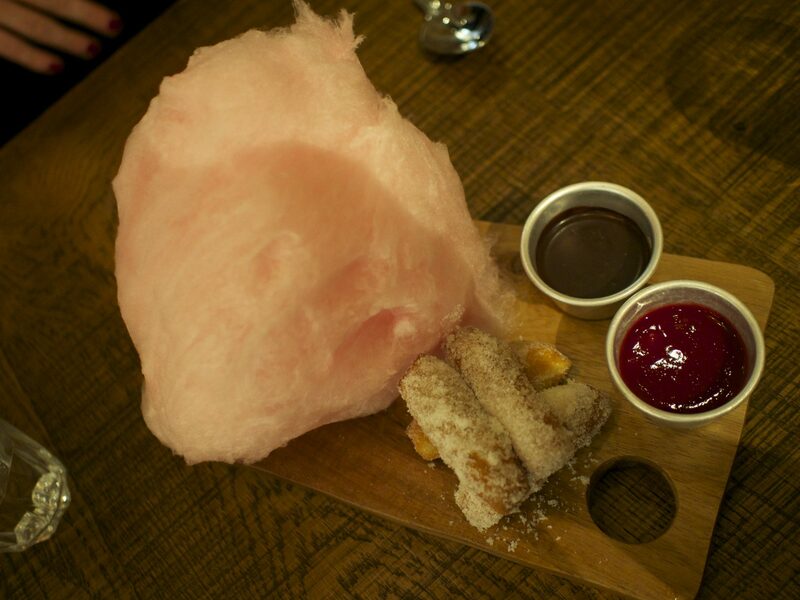 It was topped with a George’s frickle – a crazy concoction involving a deep fried pickle and pickled onion in batter! The burger was tasty if a little well done for my liking. I think these patties had spent just a little too long on the Inca grill. The dirty mayonnaise, red leicester and other accoutrements really made it sing however and I soon forgot about my initial disappointment. 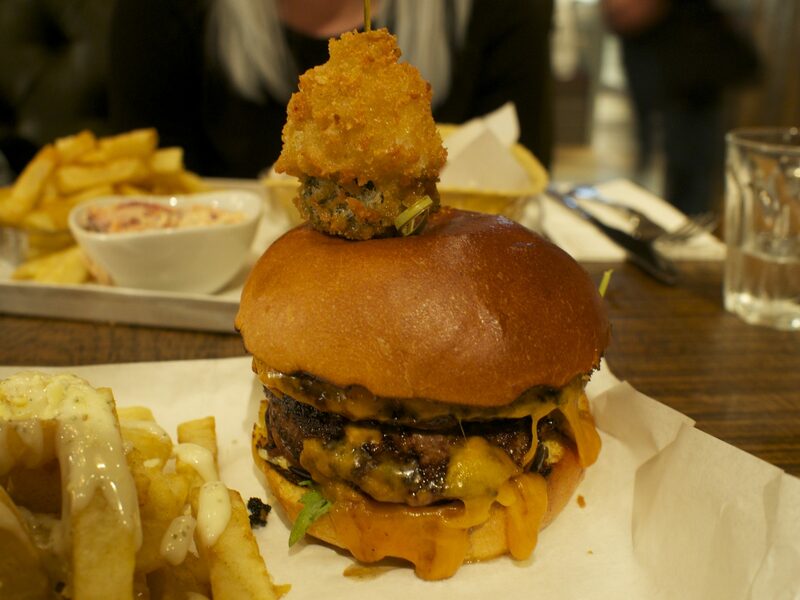 It was a proper, dirty burger. The frickle was a bit gimmicky if you ask me, but maybe I’m missing something! The Stilton fries however were out of this world. Proper chippy chips with a blue cheese sauce as well as crumbled Stilton, which wasn’t overpowering – absolute perfection. They came served on a chip shovel t0 add to the chip shop vibe. GG enjoyed her chicken, which was crisp and well seasoned and her favourite thing was the sweetcorn pancakes, she was delighted that she got two! The maple bacon was another nice accompaniment, the bit I tried was very moreish. 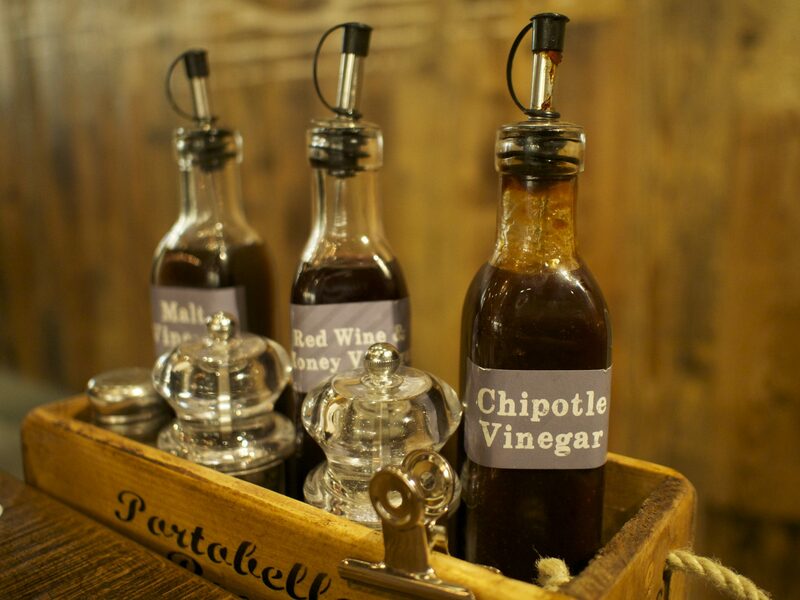 GG was also particularly taken by the condiments, which are attached to your table. She gave them all a go and the Chipotle vinegar was her favourite. Finishing our meals, the generous portions meant we had little room for dessert but wanted to sample something from the nostalgic sounding sweet menu. 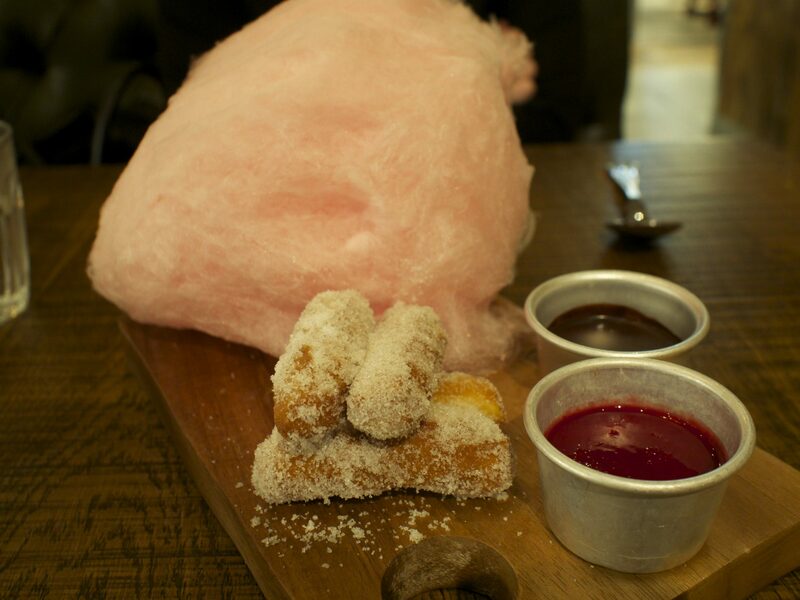 We decided to share some fresh homemade doughnuts with a chocolate dipping sauce, raspberry dipping sauce and candyfloss on the side (£4.75). All in all George’s Great British Kitchen is a fun place to go for some tasty food with a side order of nostalgia. They have pulled off with aplomb what could quite easily have been tacky. 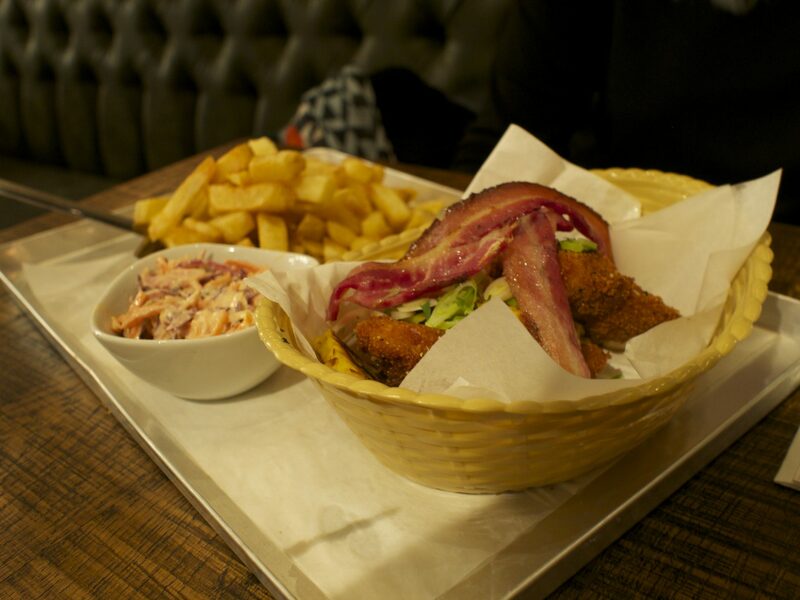 If you go, definitely have the stilton fries and let me know what you think! 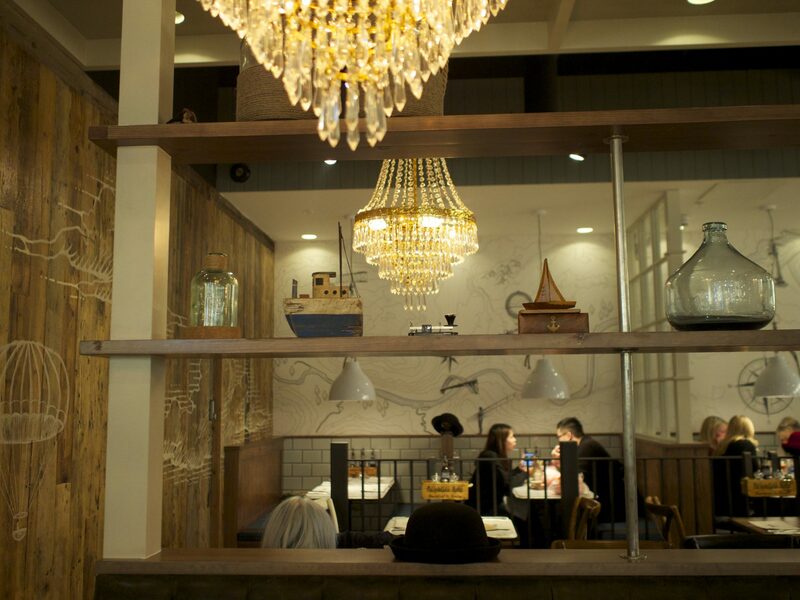 George’s Great British Kitchen is located at INTU Eldon Square, Newcastle upon Tyne, NE1 7JB.